This morning I dropped nearly 500 envelopes in the mail at the Post Office. 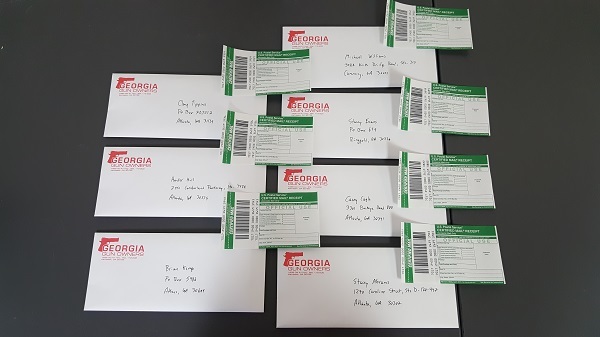 Inside those envelopes contain our 2018 Georgia Gun Owners Candidate Survey. Our Candidate Survey asks hard-hitting Second Amendment questions we expect every candidate who filed to run for Governor, Lt. Governor and the General Assembly to answer. The most hotly contested race here in Georgia in 2018 is the race for Governor. Below is a picture of the Candidate Surveys sent via certified mail to each candidate for Governor. In the coming days, I’ll ask you to contact each of these candidates and encourage them to review the survey, fill it out and return to our headquarters here in Kennesaw by the deadline, April 9. How many times do you hear this from candidates on the left and right: “I’m a supporter of the Second Amendment”, then once safely in office, do the opposite? Our Candidate Survey is designed to cut through the politician mumbo-jumbo speech, and instead ask specific questions about the Second Amendment. Once our Candidate Survey deadline has passed, we’ll report how each candidate responded (or didn’t respond) to voters and Second Amendment supporters across the state. You might have noticed that our Candidate Survey program is different than the survey program sometimes run by the establishment gun lobby . . .
We actually report the results of our survey, along with all relevant information about the candidate related to the Second Amendment. Often times, the establishment hides the results, or even throws an endorsement to a politician, all in the name of political expediency. Georgia Gun Owners will NEVER do that. Additionally, Georgia Gun Owners does not support, endorse, or oppose candidates for political office. We report the facts of our survey, candidate’s statements and votes. Then you decide who to vote for. Please check your email and social media frequently for updates on all the latest Candidate Survey alerts. We need you to make calls, send emails, and make sure these candidates go on the record. Additionally, if you’ve yet to renew your membership in GGO, or join for the first time, please do so right now. If you’ve already joined or renewed and would like to chip in $10 or $20, we’ll use your generous support to make our Candidate Survey program bigger and badder than it’s ever been before.